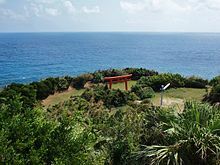 Tanegashima (種子島) is an island in Kagoshima prefecture, south of Kyushu. Tanegashima has two claims to fame. In 1543, Portuguese explorer Mendes Pinto found his way there and introduces firearms to the Japanese, and for a long time thereafter rifles were known as tanegashima in Japanese. These days, though, the main attraction is Tanegashima Space Center, JAXA's main spaceport. New Tanegashima Airport (TNE IATA) has five flights daily from Kagoshima (30 min) and one flight daily from Osaka-Itami (1:20), all on Japan Air Commuter , a JAL subsidiary. The airport has scheduled bus services to Nishiomote (38 min, ¥790) and Iwasaki Hotel (62 min, ¥1270). A taxi to Nishiomote costs about ¥6000. The "Toppy" (トッピー) and "Rocket" (ロケット) Jetfoil ferries (formerly two separate companies) can be taken from Kagoshima; 4-6 of them take 1:35, one of them takes 2 hours and stops in Isubuki, and one takes 3:15 and stops in Yakushima on its way back to Kagoshima. They cost 7100 yen (as of Dec. 2016 ; -50% for kids, ; small discount for return tickets). Regular ferry as well as jet foil ferry services are cancelled in case of bad weather (waves more than 3 meters high). It is also better to make a reservation at least the day before, some boats can be fully booked. Timetables are available on this page (Japanese; Kagoshima: 鹿児島, Tanegashima: 種子島). Before your departure, you can see the traffic situation on this other page. The important symbols are: "○" (normal traffic), "△" (under condition) "※" (unknown), "欠" (cancelled) et "－" (not in operation). The Princess Wakasa car ferry runs once daily (3.5 hours, ¥3,700 in standard class, -50% for children up to 12 years, small discount for return tickets). The easiest way to get around Tanegashima is to bring or rent a car. Contact information for taxi (タクシー) and rental car (レンタカー) companies is here: . Tanegashima Space Center (種子島宇宙センター), Mazu, Kukinaga, Minamitane-cho, Kumage-gun, Kagoshima 891-3793, ☎ +81-997-26-9244. Daily 9:30 AM-5PM, Jul-Aug 9:30AM-5:30PM; closed M-Tu after long weekends and Dec 29-Jan 1. Japan's largest spaceport. Free exhibits and guided tours three times daily (reservations required). No entry during launch days, but there are designated viewing points around the perimeter. Free. Chikura Caverns (千座の岩屋). White sand beach with caves that can be entered at low tide. There are picnic tables at the edge of the beach. There are a couple food stands and drink machines. free. Takezaki Beach (竹崎海岸). Beach at the Tanegashima Space Center. Long, white sand beach with areas for snorkeling close to the east side. Restroom with changing area and place to rinse feet is available beside the free parking area. Covered picnic tables nearby on lawn of space center. free. Cape Kadokura (門倉岬). Cape overlooking the rocks and shore where the first firearms entered Japan. Beautiful view. There is a lookout post shaped like an old ship. A small shrine is nearby. Restrooms available beside the free parking area. free. Tanegashima is a well known destination for surfers in Japan. Moonbar  [dead link] The best place. Breyen-san and Tomoko-san is running the cosy place perfectly. This city travel guide to Tanegashima is an outline and needs more content. It has a template, but there is not enough information present. Please plunge forward and help it grow! This travel guide page was last edited at 17:09, on 10 September 2018 by Wikivoyage user Bigpeteb. Based on work by Wikivoyage users Fabimaru, Wrh2Bot, Traveler100bot, Halowand, Addbot, SteveRBot, CarsracBot and The Anomebot2, Wikivoyage anonymous user 84.30.215.175 and others.